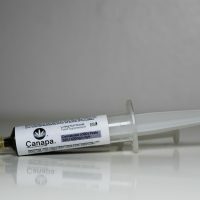 Canapa. CBD oil contains 100% natural CO2 extracted cannabis from selected farmers. In addition to cannabinoid (CBD), the C02 extraction process also preserves all other cannabinoids, terpnes, flavonoids and nutrients. The cannabidiol is CO2 extracted. The gold standard fro CO2 extraction. 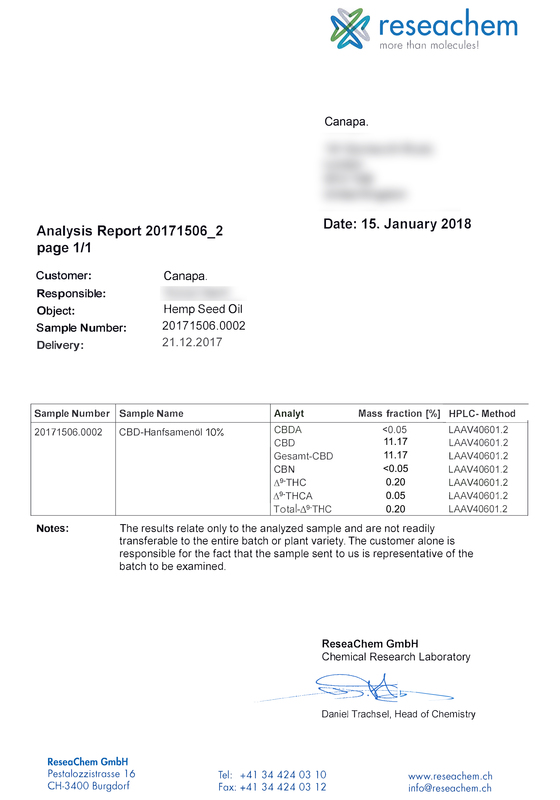 100% organic MCT oil. 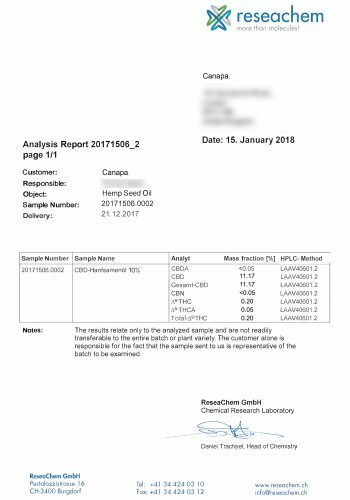 Cannabis Sativa L. Cannabinoid extract. As a dietary supplement, put a few drops under your tongue 2-3 times a day. Max 15 drops. Leave the oil in the mouth for 1 minute before swallowing. Gradually build up the dose. This is different for every individual. Do not exceed the recommended daily allowance. Drink water afterwards to help with the taste. Shake before use. Store in cool and dark place. First of all I would like to thank you. 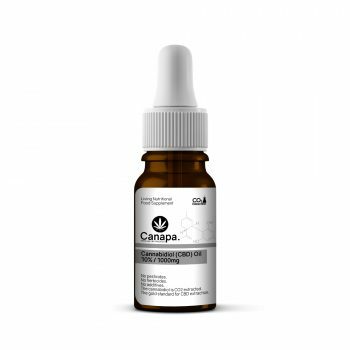 I have had surgery on my spine and other health issues, I have morphine prescribed medication and other controlled drugs that I am prescribed, I used this product yesterday for the first time and I can happily say it made me feel pain free. Before buying or using any of these products I had numerous consultations by phone with Canapa and they advised me it’s the best to use for my symptoms and I can gladly say he was 100% right. My son purchased this for me to help with M.E/CFS and fibromyalgia symptoms which I have had for almost 10 years. My health was slowly deteriorating and I was spending most of my time in bed and in a lot of pain. I also found it difficult to sleep yet was constantly fatigued. I started to forget my words and was experiencing visual disturbances and dizziness/nausea. I have been taking this for 1 week and the first thing I noticed was I slept right through the night, next the usual nausea disappeared after eating, with the most marked difference being my energy levels increasing considerably. This week I have spent 2 days in bed compared to my usual 6/7 and have been out shopping, took the kids activities, and coffee with friends with considerably less ‘payback’ than usual. It’s early days but nothing the doctors have prescribed so far has had this positive effect on my health, and I am excited to see my health improve over time using this oil. I am wholeheartedly recommending this product, it is natural, organic and has no contraindications/side effects. Please give it a try, it has helped me so much! Really happy with my purchase, this oil has helped me relax and sleep better already! I am feeling less anxious and generally more positive. I have also noticed an increase in my energy levels which has helped me to exercise more and put additional effort in. Would def. recommend this oil, thank you for a great product. I suffer from Sciatica which comes on and off every now and then since I was 18. The past few days have been really bad and I couldn’t stand straight or walk properly. Sleeping at night was also extremely painful as every slight movement would wake me up from the pain. I took the CBD oil, 5 drops 3 times a day and after two days the pain has almost gone, I am sleeping through the night with no pain, I can walk without pain and I can now stand up straight. I will no longer take painkillers for my Sciatica and stick to back stretches and oil from now on.